Blog » Diet » New Study Shows Chocolate Causes Acne, But..
New Study Shows Chocolate Causes Acne, But..
It’s here. The day we’ve all been dreading. Recently published double-blinded study shows chocolate causes acne. The researchers showed that a single binge of chocolate increased the number of pimples by whopping 169% in a matter of days. The role of chocolate in acne has been controversial, to say the least. In 1969 Fullerton and colleagues published a crappy study that showed chocolate has no effect on acne, and ever since dermatologists have insisted neither chocolate nor diet in general has any effect on acne. In an earlier post I wrote about a preliminary and unpublished results that showed a massive increase in acne after consumption of pure cocoa. I didn’t want to believe it and at that post I wrote that it’s unlikely chocolate causes acne. University of Miami researchers followed their preliminary results with a little bit better study that was published in the May 2014 issue of The Journal Of Clinical And Aesthetic Dermatology. The study was designed to answer what happens after a binge consumption of chocolate. They recruited 14 men, aged between 18 and 35, and gave each participant 6 1oz capsules to consume in one sitting. In total every participant consumed 6oz (170g) of capsules. The capsules were filled either with pure cocoa or gelatin. Each participant was handed a mixture of capsules in a way that stepped up the dose of cocoa from 0oz to 6oz. So one person received 6 gelatin capsules, another 5 gelatin and 1 cocoa, and all the way to 6 cocoa capsules. Here are the results, measured as the number of inflammatory and non-inflammatory (blackheads, whiteheads, etc.) pimples. Day 0 is the day the participants consumed the capsules. Source: Caperton, et al. Double-blind, Placebo-controlled Study Assessing the Effect of Chocolate Consumption in Subjects with a History of Acne Vulgaris. J Clin Aesthet Dermatol. May 2014; 7(5): 19–23. The number of both inflammatory and non-inflammatory pimples skyrocketed the days following chocolate consumption. Compared to day 0 the number of non-inflammatory pimples increased by 140% and 160% in days 4 and 7 respectively. For inflammatory pimples the figures are even more grisly: 433% and 233%. Though I should say that most of the participants only had mild acne and not too many inflammatory pimples at the baseline. 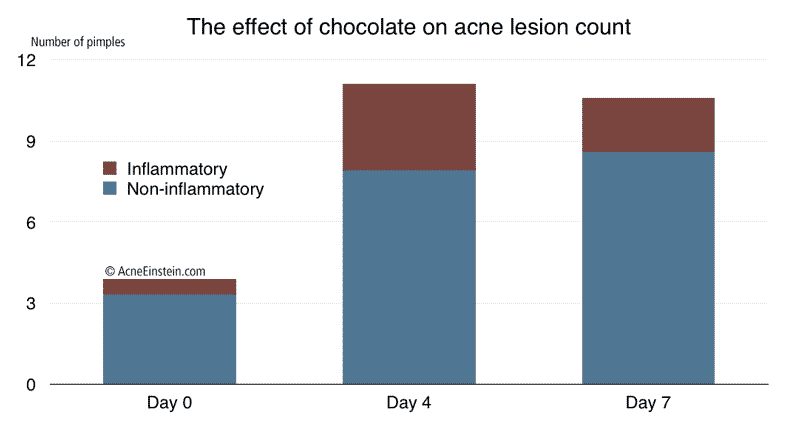 It seems the participants who consumed a larger dose of cocoa also got more pimples, as the cocoa dose and number of inflammatory and non-inflammatory pimples was correlated, though the correlation wasn’t a particularly strong. However, don’t get depressed yet. There are some fairly serious problems with the study and this may be a spurious result. I’ll explain the problems a bit later. FODMAPs – link between chocolate and acne? It’s not exactly clear why cocoa causes, or I should say aggravates acne. My own experience shows it may have something to do with gut health. For the past few months I’ve been going to the gym actively and taking whey protein shakes. I often mix whey protein and cocoa powder into a green smoothie. For the past 6 weeks my skin has been worse than normally and I’ve had mild constipation. I suspect it’s due to cocoa powder as I have no problems with whey protein itself. Cocoa powder has moderately high amounts of FODMAPs, and can cause gut problems and in people with FODMAP intolerance. Other studies show people with acne have much higher rates of gut problems than people with clear skin. This may explain the connection between cocoa and acne, but we have to wait for further research to confirm it. Earlier I also wrote about a study that showed chocolate aggravates the immune response against acne bacteria. This causes more inflammation at the skin and can also aggravate acne. After devastation and scraping myself off the floor, it’s time to think rationally about what these results mean. There are two serious problems with the study: small size and no lack of proper control group. Bear with me for a minute as I explain why you can’t take this study at face value. This may turn out to be a false positive. 14 participants is a very small study and small studies are always prone to errors. Because we don’t have such comparison we can’t rule out other possibilities. Prof Bob in the comments mentioned this could be regression to mean. Acne waxes and wanes over time. The researchers only chose participants with very mild acne, you can see that the average number of inflammatory pimples at day 0 is less than 1. Perhaps what we are seeing is natural variation in acne and not cocoa causing acne. The point is that we can’t say for sure that it was cocoa that caused the problem. It may have been, but we can’t rule out the other possibilities based on this study. What does this mean? No more chocolate? This study provides more evidence to support the idea that chocolate causes acne. Whether that turns out to be true or not is for future studies to show. But there’s still hope even if we take this study at face value. This study looked at binge consumption, and the participants consumed fairly large quantities of cocoa. Consuming a serving or two may not cause problems. Ironically, dark chocolate may be the worst for the skin. Milk and white chocolates contain less cocoa. Of course they also contain more sugar and milk, but small amounts of sugar and milk may be less bad for your skin. It really depends on what your skin reacts to. Also, this study didn’t include any women (to exclude hormonal cycles from confounding the results). But one should keep in mind that acne forums contain countless examples of women complaining about acne following chocolate consumption. At the moment, the best we can do is to put chocolate back on the suspect foods list. Keep an eye on your skin after you eat chocolate and see if it causes problems for you. What do you think of this? Have you noticed that chocolate aggravates acne? Double-blind, Placebo-controlled Study Assessing the Effect of Chocolate Consumption in Subjects with a History of Acne Vulgaris. Thanks Seppo, I read the paper and couldn’t quite understand the way they presented the data. 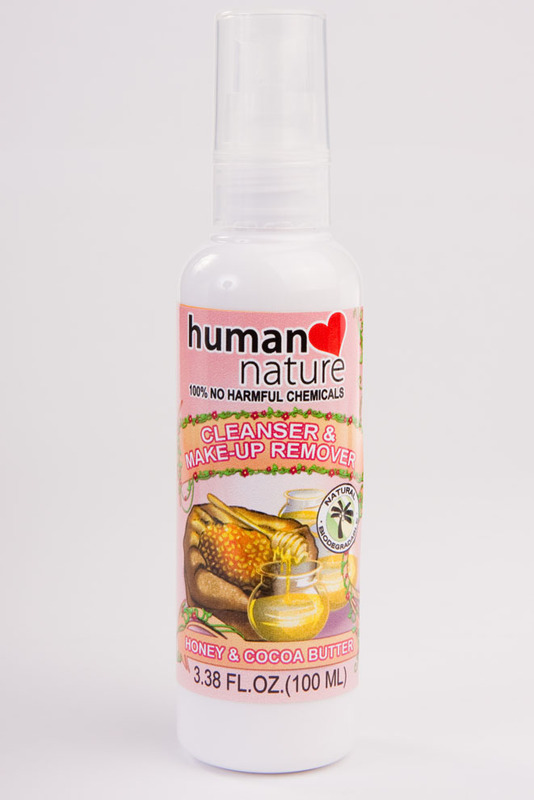 Are the figures showing an increase in acne on day 4 & 7 for all the conditions – including those that had zero cocoa powder? Why don’t they show a control bar for those who had zero cocoa (all gelatin) ? I think the answer is in the correlation graph they show as the points are all over the place with a very loose relationship between amount of cocoa and increase in acne. Maybe we’re seeing a general increase in acne, almost regardless of the amount of cocoa, over the 7 days due to stress of not knowing what’s in your capsule? Best, Bob. Or it might just be a regression to the mean effect – as they only let people in the study that get acne but happened to have a low amount at the study start – as we all now acne tends to go in cycles – so if they recruited people in the ‘down’ part of their acne cycle it’s likely their acne might increase in the next 7 days. Looking again at the correlations there are no p levels shown – so I suspect these we’re non-significant meaning there was no (statistical) evidence that amount of cocoa influenced the increase in acne – so it was just a general increase across all conditions. Strange that they ran the study with so few people – you’d a lot more to show the correlation is significant at the moderate level of association that’s likely to be present. Regarding the correlation. I also thought the points seemed a bit all over the place, but I took the authors’ for their word in this case. It’s not unusual to see such scattered graphs in any study that deals with diet. In the light of your comments, I think I have to reword the post a bit. There are other explanations for these results that we can’t exclude yet, as you pointed out. You’re welcome! I quickly checked some stats tables for correlations and if I’ve got them right then with 10 data points (there were just 10 people?) you’d need a correlation of 0.549 or higher to be significant at p<0.05 for a one tailed test (as we expect the correlation to be positive – and aren't really testing to see if it's negative). So basically they found no evidence of a relationship between amount of cocoa and degree of acne increase. Actually, there were 14 people in the study. In that case a correlation of 0.429 is enough for p<0.05. I think they got something like that for one of the correlations, but definitely not for all. I was thinking of exactly the same thing when I was reading the paper. I almost made a comment of it to the post but decided to leave it out since it’s not that relevant to most readers. I do think that the numbers include all the participants. They only had 2 people per dose group so showing the 2 people who got no cocoa doesn’t really make sense. That said, I don’t understand why they chose to have so many different doses as their study was not powered to detect anything nearly that fine grained. It would have been better to give 1 group no cocoa and another nothing but cocoa. That would have provided more useful results. Yes they got 0.474 for just inflammatory lesions; it’s the degrees of freedom (N-2) that guides the significance threshold – so I think that’s 0.457 – so just OK ! Perhaps there’s something in it – but as you say it’d have been much better to have half the group having all cocoa and the other half none – and to have many more people! Hey Seppo, are you pretty sure that whey protein has no constipation-inducing effect on you? How sure are you that it’s the cocoa powder? I’ve been struggling with some mild constipation for a long while now, and I regularly eat ~50g of dark chocolate per day, so I’m wondering if there’s a possible link there, maybe having to do with FODMAPs. Generally speaking, though, dairy makes me constipated, hence asking about your experience with whey. How often do you get people asking you about whey protein, protein powders, bulking up at the gym without getting acne, etc.? I’ve gone through a bunch of phases of heavy weightlifting, whey protein shakes, etc., and always end up back where I started, losing the weight I’ve gained again (whey protein, in particular, gives me acne). I’ve started recommending egg white protein to people as an alternative. As is always the case with anecdotal data and observations, I can’t be absolutely sure of that. But I’ve been taking whey protein for 4 months now and for the most part my skin has been doing good. It’s only in the past few weeks that I’ve had problems. About 4 days ago I stopped having green smoothies for breakfast and went back to scrambled eggs with tuna and my skin is getting much better now. Most of the scalp acne has faded away and my tummy is doing better. I’ve been still taking whey protein, I just mix it with water or milk. It’s also possible that the 2 bananas I put into the green smoothies is what caused the problem. And I can’t rule out the possibility that my scrambled eggs with tuna breakfast does something good for my gut and skin. But I think its more likely that either bananas or cocoa or both is to blame. I also have no problems with dairy. I’ve been eating homemade yogurt for a better part of 3 years now and have never noticed any problems. I also didn’t notice any problems after I started drinking more milk as a part of my weight loss and shaping up routine. Before I started taking whey and drinking milk, I tried drinking a lot of soy milk. What a freaking disaster that turned out to be. Soy milk caused ridiculous constipation and completely messed up my skin. How often do you get people asking you about whey protein, protein powders, bulking up at the gym without getting acne, etc.? Not that often anymore. In the comments section on my whey protein and bodybuilding posts I’ve had discussions with some people. I think the 2 most important pieces of advice I would give are: try alternative protein source and no ridiculous bulking diets (i.e. don’t eat much over your caloric requirements). I’ve gone through a bunch of phases of heavy weightlifting, whey protein shakes, etc., and always end up back where I started, losing the weight I’ve gained again (whey protein, in particular, gives me acne). I’ve started recommending egg white protein to people as an alternative. So far I have nothing but good results to report. I’ve been going to the gym since the beginning of the year and started taking whey sometimes in Feb/March. I got more serious about it in March and have since dropped my BF% from 23 to 16 and added more or less the same amount in lean mass since my weight hasn’t dropped a lot. That said, I was quite badly out of shape when I started so a lot of this has been beginner’s gains. Just my two cents here, but I have an observation and a story to tell. First of all, I’m always reluctant to read studies about a very specific food that might or might not cause acne. So in this case – cacao. What part of cacao causes the breakouts? Is there an inflammatory agent? The oils? Something that affect hormonal levels? Is this “thing” that’s in chocolate present in other foods? What’s the chain of events here? That said, you gotta start somewhere, so at least this study is trying to investigate a link. One day I’m sure we’ll know more about the connection between chocolate and skin, if any. Secondly, the story. I think that while science is great, sometimes you have to try something for yourself to see if it works for you. I’ve tried eliminating chocolate before. I’ve also had about 30 chocolates a day for two weeks (it was from abroad, it was delicious, and I’m not ashamed). Acne? No effect. At all. And then the other time I decided to be all healthy and started adding almonds and walnuts to my diet. Let’s just say my skin was not a fan. . . It takes personal exploration in the kitchen to find your trigger sometimes. Heck, cheese helps me clear up my skin! But that’s not true for everyone, so I don’t suggest you gorge on cheese and chocolate, hoping for a miracle. It’s just something to keep in mind. There’s probably no universal friend or foe in the food world for acne prone people – fortunately or unfortunately. This is a huge point. While we can give some good general recommendations about which foods are likely to cause acne, ultimately, each person is so incredibly different in genetic makeup, epigenetic expression, and environment that what triggers acne for Bob might clear it up for Jane. Super interesting point about the cheese! I wonder if you’re getting some fat-soluble vitamins from it that you’re not otherwise getting enough of? Potential problematic things in chocolate – phytic acid (tons of it), mycotoxin contamination (maybe) which can have endocrine-disrupting effects, caffeine/theobromine/other phenols – chocolate is like coffee in that in contains hundreds of active compounds that may or may not interact with each other in complex ways, so I imagine it’ll be a while until we have a deep understanding of what it does to different bodies. Until then, n=1 self-testing works great! I love reading new scientific findings, but I try not to believe in them blindly. After all, there is not one-size-fits-all solution to any health problem, and acne is no exception. As for the cheese, it could be the vitamin A or the sulfur . . but that is just a wild guess on my part. Thank you for the chocolate “deconstruction!” It would be great to see studies focusing on each of those elements individually as opposed to cacao as a whole. But one step at a time I guess. You made some very good points, Mariya Z. Studies can never tell what triggers acne for you. Studies are good for describing what happens on average on a larger population, but within every study there are a range of responders. Limitations aside, science and controlled studies are our best chance to get to the bottom of acne. While they may not tell you exactly what do to they are very good for narrowing down things to try. Science also helps us to make educated guesses about things that have not yet been studied. Once we understand the mechanism (hormones, cytokines and other cellular mechanisms) involved in acne we can make educated guesses about how various foods and treatments affect acne. Let’s say someone emails me suspecting that cucumbers cause acne for them. Given what we know of acne now it’s very unlikely that cucumbers would cause acne for someone, they just have little to no effect on the pathogenic mechanisms behind acne. So unless that person has repeatedly and consistently confirmed that cucumbers indeed cause acne for him, I would conclude it’s probably a spurious correlation. Given how bad humans are at making this kind of observations, this is a much more plausible than cucumbers actually causing acne. Anyway, none of this negates the fact that the only way to know what triggers acne for you is to experiment. True! I’m very happy that scientist out there are testing out different things that could potentially be a trigger or a solution for acne. Without all these studies, we’d be at square one for ages. That said, you have to see if a certain study makes sense and test it out for your own skin/body type. I’ve seen people who ask me for skin advice after reading a study or hear a rumor that something works. . . and sadly they keep at it even when it makes their acne worse. It’s good that they are doing their research, but unfortunately anxiety about acne depletes people of their common sense sometimes. About cucumbers – as innocent as they seem, I know one person who is extremely allergic to them. If he was acne prone, it would probably have some sort of effect. But I don’t think there is any need to panic and start eliminating every food that acne blogs deem the enemy. Most likely it will just create a stress response every time the person is faced with that food. It might be a good idea to eliminate one food at a time for a couple of weeks if there are any suspicions of an allergy (I have a mild allergy to tree nuts), but that’s as far as I would take it. Agree. I also don’t advocate excessively cutting out foods in order to get clear. Usually that just leads to stress and social isolation that can be even worse for the skin. But if dietary restrictions are needed science provides a good starting point for experimentation. Had I not read about studies that show people with skin problems have higher rates of gut problems, I don’t think I would have ever made the connection. I mean who would go ‘Hmm.. my bowel movements seem little out of the ordinary, I wonder if that’s what causes my acne’. That said, I still eat many foods that many would consider strict no-nos for acne, like milk and whey protein. I’ve never noticed they have any negative effect on my skin, so I’m happy to keep them in my diet. And yes, it’s possible some people are allergic to cucumber, and it’s possible for any food to cause acne. That’s why I mentioned that if someone has repeatedly and consistently observed the link I will believe it. The point is that these extremely rare reactions are just that, extremely rare. The likelihood of them causing acne for any single individual is very, very low. The problem is that people are very poor observers. History of science is riddled with people thinking something causes something but later research showing that’s just not the case. That’s why I’m always a bit skeptical when people tell me some food causes acne for them, especially if it’s not one of the usual suspects. I always try to think what’s the most likely explanation here; rare food reaction or a mistake in observation (very common). I went over their website but I couldn’t find much there to evaluate the products. For example, I couldn’t find ingredient lists for their products. Based on the marketing speak, the products could be ok. Given that at least some contain salicylic acid, they should help your skin. They also advertise ‘phyto-active Ginger complex’, but it’s impossible to say anything about that. If you can send me more details on the products I can take a closer look. Can I ask you what kind of diet are you following (loosely… ) yourself? I have your book and I know it’s individual in what we react to but I’d be interested to hear what works for you specifically. Ouch, i ate some chocolate yesterday at the gym, (protein bar with chocolate) And I got a red pimple, not a big one but an inflammatory one today. I only ate the amount of what would be a half chocolate bar. Hi Seppo. What do you think of this product? It’s got natural vit. E, dark honey, bee propolis, goat’s milk, beeswax, COCOA butter. It says cocoa is a pretty good moisturizer. I can’t really comment without seeing the ingredients list. That said, it really doesn’t matter much what kind of cleanser you use (that product looks like a cleanser to me? ), as long as it doesn’t irritate your skin. Most people probably don’t have any problems with cocoa butter. But it is highly comedogenic and can cause acne for some people. The ones I enumerated are all that’s indicated in the bottle. Yup, it’s a cleanser & moisturizer. I just looked comedogenic up. Uh-oh.. it can highly likely block pores. Due to the honey, I presumed that the product will open the pores instead. Though the only effect I’ve noticed is smoothness, I guess I’ll have to stop using it. Just because a product has comedogenic ingredients doesn’t mean it will cause acne. The whole comedogenicity is a bit of a misunderstood concept. I wrote a point about it on another site some time back. Please see it as it explains why you shouldn’t worry about comedogenicity too much. Hmm I’m pretty sceptical of the study. Only thirteen participants completed the study, and if there were seven treatments (6 oz gelatin, 5 oz gelatin and 1 oz cocoa… all the way up to 6 oz of cocoa) then that means that one treatment condition’s results were based 100% on one person’s results. Aside from small sample size, it was also an outpatient program. We can’t be sure that the two people (or one person) getting 6 oz of cocoa didn’t for whatever reason eat more poorly or experience more stress or sleep less those few days they were in the study. We definitely need a much larger sample size before drawing any conclusions… I’m also not sure how their participants were recruited, but since they’re based out of a university I’m wondering if their participants were male university students (in which case this could have been conducted around midterm or finals season, who knows). Also, what brand of cocoa powder did they use? I couldn’t find it in the paper; they just said 100% unsweetened. There might be variation between Dutch-process and regular cocoa powder (considering all the speculation that Dutch-process is better because it’s lower in theobromine). The pilot study they kept mentioning used Ghirardelli baking chocolate (100% cacao), not cocoa powder. Yep, there are some serious problems with this study. At best we can say that chocolate is a suspect food, especially considering countless anecdotal reports saying chocolate triggers acne. I bought the book recently and thoroughly enjoyed reading through it. Although, a lot of it was common sense, the piecing together of all pieces of the puzzle made it a huge revelation. Thank you! I am a PCOS and acne sufferer with extremely moody (changes patterns very frequently) acne. There are times when it clears when I consistently drink more water (at least a gallon a day), but it is hard to sustain esp. during travel and busy work days. What is your take on the amount of water consumption and acne? Unless you are actually dehydrated, I’m not sure that drinking more water would help acne. It might, but I’m quite skeptical. Perhaps this is a case of confusing correlation with causation? Could there be something else that caused the improvement in acne? My recommendation would be to drink when you are thirsty and leave it at that. I’m not sure it’s smart to force yourself to drink more than you think it’s necessary. All that said, I haven’t seen any research on this. So if you have some good sources or information, I’ll be happy to take a look at them. PS. Glad to hear you liked the book. I’m in the process of updating it into an online course with new information. As a customer you’ll be upgraded for free once I get everything done. It is possible that the days I tend to drink more water are the days I eat more protein/fat i.e. lower carb intake. It could be the lower GL of my diet on those days that helps clear my acne!! Most likely there’s something like that going on. Do you think this study includes raw cacao? I use raw cacao in my smoothie every day. I suppose this is contributing to my acne issues. Yes, they actually used pure cocoa in this study. After about 3 months of strictly following a paleo style diet with loads of antioxidants, home cultured foods everyday, gut healing foods, hacked green tea etc. I can’t get my body/chest consistently clearer but my digestion has improved greatly. I just started doing a 30 day food elimination challenge to see if I can identify any triggers as per one of your articles but when re-introducing foods how long do you think it takes to notice a change in acne? In your experience do you find trigger foods have a noticeable effect within 3 days (as per standard food elimination diet protocol), like cocoa for instance? Better to look for other symptoms? This varies. I would give it 2 to 3 weeks to see if a particular food gives you acne. It can happen much faster also, but to be on the safe side I would give it 2 to 3 weeks. This sure ain’t news to me. I can categorically state that as someone who is prone to acne, there is no question that after even a little bit of chocolate, I will have an outbreak of acne. I can’t say it’s cocoa – because the same happens with any cakes and processed food. It may be the sugar content – but there is not a flicker of doubt in my mind. Of course not everyone reacts as I do – as many of my clear skinned friends can eat copious amounts of trash and it doesn’t seem to affect their complexions. Have you read 2014 article “Dark and White Chocolate Consumption and Acne Vulgaris: A Case-Control Study” (Asian Journal of Clinical Nutrition, 6: 35-40)? Yes, I’ve read that study. I have the PDF in my research library. It shows that white chocolate, but not dark, caused acne. Though, I had not seen that paper when I wrote this post. Anyway, it’s normal for studies to come up with somewhat conflicting results. Happens all the time. You have to look at the evidence as a whole and come to a reasonable conclusion based on it. Of course, ‘reasonable’ is somewhat of a subjective term, and that’s why it’s common for experts to disagree on what to make of the studies. Anyway, it’s my conclusion that even dark chocolate can cause acne for some people. Out of all the chocolate-acne studies, the one you mentioned was the only one that showed no link. 60 years old, never had problem with acne. This Xmas I rec’d box of asst chocolate squares w/varying % of cocoa; 40% to 85%. We’ve all heard about antioxidants in chocolate…well, these were yummy. I started eatin’ a few squares nightly. Ok, (ahem) sometimes more than a few. OK, some nights a LOT! I suddenly have some sort of cystic acne around my mouth, chin, and jawline and chocolate is the ONLY change in my diet. Just sayin. Well, your study may not be perfect, but it is at least accurate, so I appreciate the honesty. Every human body is slightly different, therefore the same chemical can react differently in different people. Pure cocoa (without the fat/sugar) causes horrible acne for me. If I eat enough for an extended period of time, the pimples only get larger, almost like boils. I can eat some chocolate, but definitely only in moderation. I had to switch to white chocolate between the age of 18 to 22 as I would break out in spots if I had any amount of normal or dark chocolate. I still had it occasionally as I loved it and then when I was 22 the spots never came back again. I believe that chocolate cause me break out. When I stop eating, break out stop also. I have had some interesting and conflicting results with the use of cocoa and chocolate liquor. I started putting it in my breakfast oatmeal porridge when I read that it can be good for the skin and protect against sun damage. Being that my nose burns really easily (I think I might have mild rosacea) and I was living in a place with really strong and burning sun because of high altitude, I thought I would give it a try. The skin of my face cleared up beautifully, the pimples on my chin and forehead calmed down a lot, or disappeared completely. The skin tone got a lot, lot more even, I felt the skin on my face actually looked really nice and healthy, for a change and I could look good even without any make-up on. But then my back started breaking out. I have always had tendencies for backne, but suddenly it just got a lot worse, the numbers of pimples seemed to increase and get more inflamed. I couldn’t wear white tops, because they would end up getting all these bloody spots from the acne. Then I ran out of chocolate. My face started breaking out again. My complexion was horrible, red and blotchy. It felt especially bad as I was getting used to having a pretty nice complexion, with our without make-up. But after a couple of weeks my back at least seemed to calm down a bit. I still had a lot of red spots but the inflammation seemed to be gone. They stopped popping and bleeding. Oh, why does it have to be so complicated!? Thanks for sharing, Rranga. Cocoa has a lot of antioxidants, and it could be that those are helping your skin. You could test this by drinking green tea, rooibos tea or other antioxidant-rich beverages and see if they help your skin. I didn’t need science to tell me something I already know. Around the time my father hit 56, we both had a healthy appetite for chocolate until one day he started having a rash of acne around his chin area. This is a man who stopped having breakouts after his 20’s. He went to a doctor and they blamed it on creatine production in his body…he should stop eating read meat. What a farce since my father is not a big read meat eater. My mother convinced him to give up chocolate for a week since she believed that was causing the issue. Well after a week his acne started going away…within a few days..they were back full strength and he acknowledged “he snuck a few pieces here and there”. Well my story is similar. 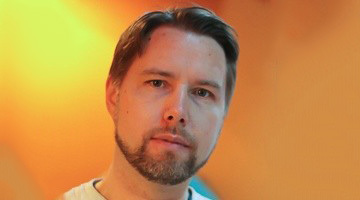 After hitting 48, I started to notice I was having breakouts on my chin literally the next day after eating chocolate. I couldn’t believe it. I seriously was a chocolate lover. I performed my own experimentation of a period of 3 months and found that I could accurately predict when I would break out… exactly 1 day or at least 24hrs after ingesting chocolate. Good grief! The only thing I have left now is coffee. I do occasionally eat chocolate and pay for it later, but the reality is chocolate will cause breakouts in SOME people. My mother continues to enjoy a healthy appetite for chocolate.